I have had a love of taking photos for many years but taken my hobby more seriously since getting a digital SLR four years ago. Having discovered that I enjoy the creative challenge of taking the photo and then the absorbing task of making the most of it in the digital darkroom, I have recently undertaken a one year full time MSc in Biological Photography and Imaging at the University of Nottingham. This gave me the opportunity to learn new skills in videography and design while returning to my academic studies - my first degree was in Psychology and Zoology. I now run a business providing marketing, design and photography support to small businesses in Nottingham and the East Midlands Pin Sharp Marketing. Favourite lenses: Tamron 17-55 and a Canon 300mm f/4 prime lens. Best gadget: An intervalometer for taking time lapse photos. Best thing about photography: That buzz when you click the shutter and know you have got a great image. Worst thing: I am hopeless at getting up early for sunrise photos, and dislike carrying heavy kit and tripods - but I know it's good for me! I am a keen member of Beeston Camera Club. If you are in the area come along to one of our club nights; interesting presentations, competitons and a chance to chat about all things photo with fellow enthusiasts. 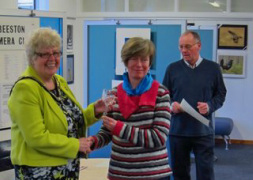 Receiving the award for Best Mono Print in the Beeston Camera Club Exhibition - on at Beeston library in March 2013. 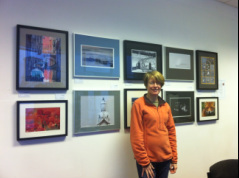 In December 2012 I took part in an exhibition at the City Gallery, Nottingham as part of the Masters' Collection. Many thanks to everyone who dropped in and especially to those who bought my pics!